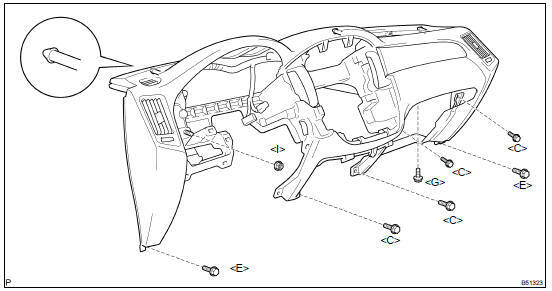 (a) Some operations in this section may affect the SRS airbags. Prior to performing the corresponding operations, read the SRS airbag NOTICE (see page 60-1 ). 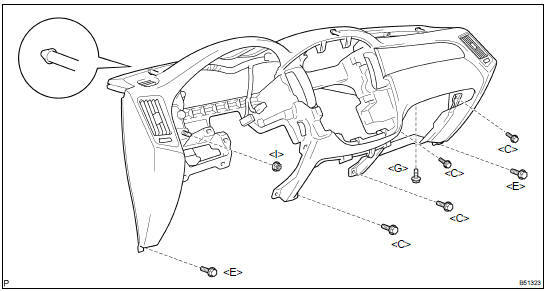 HINT: The bolts, screws and nuts necessary for installation and removal of the instrument panel, are illustrated below and alphabetically coded. (a) Using a moulding remover, disengage the 8 clips. (b) Disconnect the connectors, then remove the instrument cluster finish panel sub-assy center. HINT: Set the shift lever in the N position. (a) Using a moulding remover, disengage the 5 clips. (a) Using a moulding remover, disengage the 5 clips, then remove the instrument cluster finish panel assy. (a) Remove the 4 screws <B>. (b) Disengage the claw, then remove the instrument cluster finish panel garnish. (a) Remove the 3 screws <B>, then pull the combination meter assy. (b) Disconnect the connectors, then remove the combination meter assy. 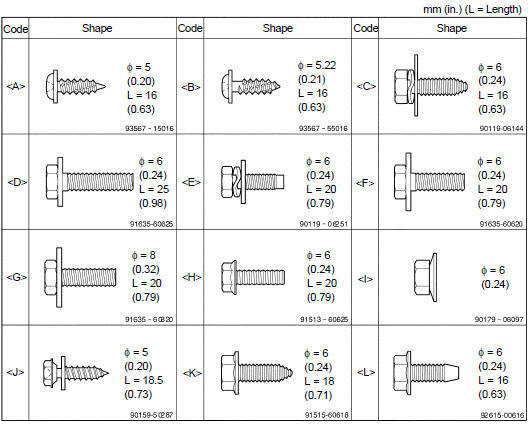 (a) Remove the 2 bolts <D>. (b) Disengage the 3 clips. (d) Disconnect the hood lock control cable, then remove the instrument panel finish panel sub-assy lower. (a) Remove the 3 bolts <F> and the instrument panel insert sub-assy LWR LH. (a) Using a moulding remover, disengage the 4 clips and the 2 claws. (b) Disconnect the connectors, then remove the instrument cluster finish panel assy center. (a) Remove the 2 clips and the floor carpet cover center LH. (a) Using a screwdriver, disengage the 2 claws and remove the seat armrest cover LH. HINT: Tape the screwdriver tip, before use. (b) Remove the bolt and front seat armrest assy center. 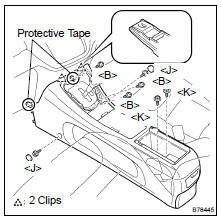 (a) Cover the parts indicated in the illustration with protective tape to prevent them from being damaged. (b) Remove the 3 screws <B>. (c) Remove the 2 console caps and the 2 screws <J>. (d) Remove the 2 bolts <K>. (e) Pull the console box assy towards the rear of the vehicle and disengage the 2 clips, and then remove the console box assy. NOTICE: Be careful not to damage the bottom of the instrument panel safety pad when removing the console box assy. (a) Remove the glove compartment door damper clip. (b) Remove the 2 clips and the glove compartment door assy. (a) Remove the 7 screws <B> and the instrument panel finish panel lower No. 2. (b) Remove the 7 bolts <C> <E> <G> and the nut <I>. (c) Disengage the 3 pins, then remove the instrument panel safety pad sub-assy. (a) Disengage the 4 clips, then remove the instrument cluster finish panel garnish No. 2. (b) Remove the automatic light control sensor. (b) Remove the cooler (solar sensor) thermistor. NOTICE: Do not pry the cooler (solar sensor) thermistor off from the upper position. (a) Remove the 3 screws and the 3 instrument panel pin No.1. (a) Remove the 7 screws <A> and the defroster nozzle assy. (a) Remove the screw <A> and the defroster nozzle duct No. 1. (a) Remove the screw <A> and the side defroster nozzle duct No. 2. (b) Remove the 3 screws <A> and the heater to register duct No. 1. (b) Remove the 3 screws <A> and the heater to register duct No. 4. (a) Remove the 4 screws <A> and the heater to register center sub duct. (a) Remove the 2 screws <A> and the instrument panel register assy lower No. 1. (a) Remove the 2 screws <A> and the instrument panel register assy No. 1. (a) Remove the 3 screws <A> and the instrument panel bracket sub-assy center. (a) Install the 7 bolts <C> <E> <G>, nut <I> with the instrument panel safety pad sub-assy.